The Buena Park Library opened a new Quiet Study Room this month. You may be thinking, its a Library, why would you need a quiet room! Well, libraries have changed a lot over the years. They have evolved into a community space where people go to attend programs, use computers, get help with homework, work on group projects, apply for their U.S. passport and of course, to check out books. Libraries of today can get very noisy at times. People still come to a library looking for a quiet place to read or study, said Mary McCasland, Library Director, and now they will find their quiet space at the Buena Park Library. 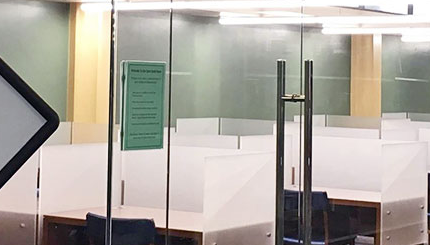 The Quiet Study Room is a light-filled, 900 square foot room enclosed with clear tempered glass walls that help reduce outside noise. Each spacious workstation features frosted dividers as well as an electrical/USB combination outlet to charge electronic devices. As part of this project, the Library also upgraded shelving and installed new group study tables throughout the 2nd floor. The new tables have electrical/USB combination outlets as well. The new Quiet Study Room is part of an ongoing effort to upgrade the library to meet the changing needs and expectations of the Buena Park community. The library is open Monday through Thursday, 10 a.m. to 8 p.m. and Friday and Saturday: 10 a.m. to 5 p.m.
For more information, please call the library at 714-826-4100, ext. 125, or visit our virtual branch at www.buenaparklibrary.org. The Buena Park Library District is located at 7150 La Palma Ave, Buena Park, CA.